There are 21 units available here at the Twin Elm Ranch for you to choose from. Each unit is clean and comfortable, includes heating and air conditioning, and all have a rustic appeal. 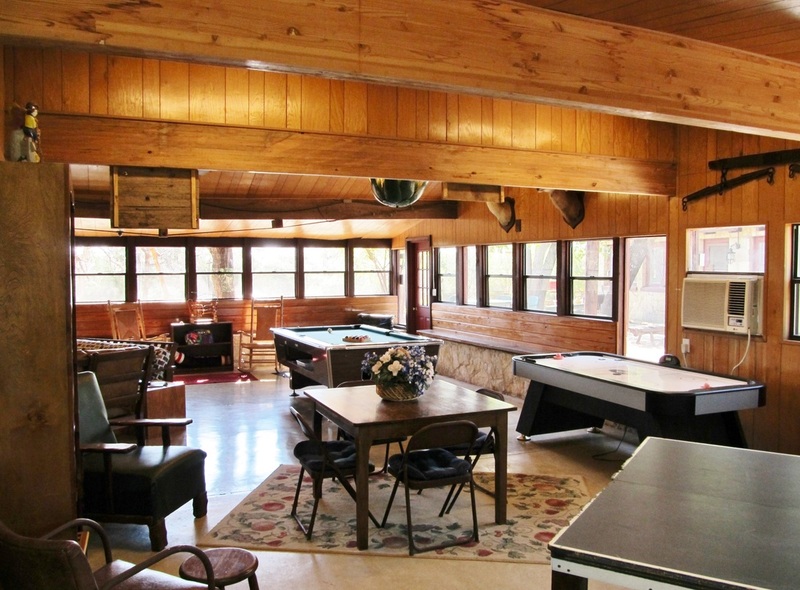 Currently we have 4 different types of Lodges each with its own character, special name, and Texas feel! 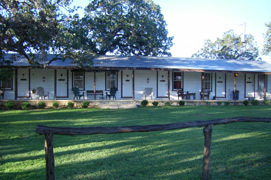 The Cowboy Bunkhouse has four units side by side with a large porch to sit and relax on. 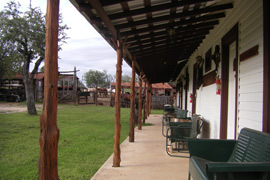 The Pioneer House is eight units side by side and has a wonderful view of the main ranch. The Travel Lodge (which is the oldest existing unit) is six units side by side complete with a screened in porch and attached to our fun game room. Please click on the pictures below to view some of the room interiors. Twin Elm offers simple yet comfortable family friendly accommodations. Each room has a different sleeping arrangement to accommodate many different needs. There are rooms with double beds only, rooms with double beds and bunk beds, even adjoining rooms with extra bunks and all have a shady porch to relax on. The Honeymoon Suite Cabin has a king size bed, 2E Cabin has a double bed with two sets of bunks and the Stirrup Lodge Cabin has two double beds with two sets of bunk beds. All three cabins have a TV with a variety of video's available upon request. Cable TV is available in the game room. Note: Thank you for not smoking in any of the rooms or cabins. One Night Package– Includes: Campfire (with s’mores, roping and/or branding demonstration) and Hayride the evening of check in, a hearty cowboy breakfast the next morning, followed by a one hour horseback ride through the scenic hills and river of the Texas Hill Country. The Room Only option is a per night, double occupancy rate (lodging only). 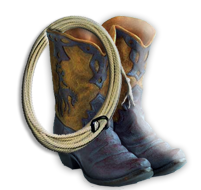 We can be your hotel or motel while in Bandera offering you that western flair. However if you decide to participate in any of our ranch activities, you may do so at the rate per activity. Reservations require a deposit of the first nights stay and balance due upon arrival. Cancellation requests must be received 30 days prior to arrival and the deposit will be refunded less a $30 cancellation fee. All other deposits are non-refundable and there is no refund for early check out. Those people bringing their horse(s) with them must please fax a copy of the current Coggins on each horse, before arrival. Those people bringing their dog(s) with them to please fax a copy of the current shot record, before arrival.